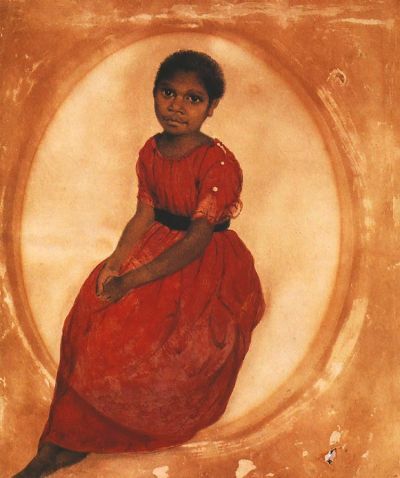 Mathinna (1835–52), south-west Aborigine, originally named Mary, was born on Flinders Island in 1835, the daughter of Towterer (Romeo), chief of the Lowreenne people of south-west Tasmania, and Wongerneep (Evelyne). The Franklins on their visit to Wybalenna in 1838 were impressed with her intelligence and appealing manner, and in 1839 she was sent to Hobart to live at Government House. The Franklins named her Mathinna and educated her with their daughter until their recall to England in 1843. After a year at the Queen's Orphan School, Mathinna returned to Wybalenna, moving with the other Aborigines to Oyster Cove in 1847. She continued her education at the Orphan School and in 1851 she returned to Oyster Cove. Mathinna resorted to heavy drinking that contributed to her death by drowning. Further reading: W Denison, Varieties of vice-regal life, London, 1870; H Felton, The Lowreenne people and Mathinna, [Hobart], 1984; N Plomley (ed), Weep in silence, Hobart, 1987.